Be watching the ironman titles in 7 or 8 years, because we’re betting young Tobey Ring will be up there with the best of them! The 11 year old, a Year 6 student of Talara Primary College at Currimundi joined the nippers at Metropolitan Caloundra Surf Club this year and has become a keen paddler. He recently competed in his first Queensland title and despite being new to the sport, placed in the top 32 paddlers in the state. 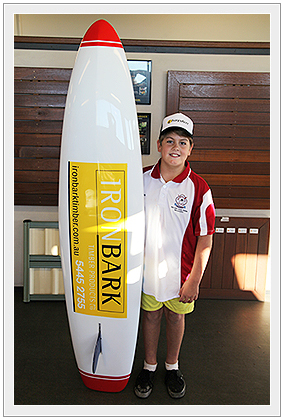 Tobey is looking to improve substantially next season after taking delivery of a new paddleboard sponsored by Ironbark Timber at Maroochydore. The board was created by the renowned Hayden Surfcraft factory.